Secretary of State Rex Tillerson this week broke his own self-imposed hiring freeze at the State Department, giving the green light to new blood in signing off on the tradition of welcoming classes of new foreign service officers into a diplomatic training program. In both July and September, there will be A100 Foreign Service officer classes, the mandatory introductory training class. This is where all foreign service officers get their start. This news is welcomed by many current State Department employees. "Morale at the department is low but I breathed a sigh of relief when I heard this," said one State Department official upon hearing the news that the A100 classes would indeed go forward this year. "Tillerson is going to gut the department, but at least he is protecting the core function of the State Department: The foreign service officers." Yet just a few weeks ago, it was expected that the hiring freeze would also apply to these new incoming officers. When Tillerson testified on the Hill during budget hearings, the hiring freeze attracted criticism from both sides of the isle. The hiring freeze would have meant breaking promises to a diverse group of students who sought a career in diplomacy through the Rangel and Pickering fellowship programs, facilitated by the U.S. government in partnership with universities. The fellowship programs recruit and prepare students from historically underrepresented groups for careers as U.S. diplomats, promise them that they will have the opportunity to land a position which will lead them to becoming a career foreign service officer. These fellows make up 21 percent of the diversity at the State Department. Now that the department has projected personnel levels for the upcoming year, they have decided to keep the incoming officer stream. "The Department remains committed to the Pickering and Rangel programs as our premier diversity recruitment programs, which together are responsible for 21 percent of the diversity currently in the Foreign Service. We look forward to welcoming these talented individuals and the entire future membership of these upcoming A-100 classes to our workforce," wrote State Department spokeswoman Heather Nauert. On June 15, Nauert the individuals would be offered "alternative Foreign Service opportunity in the short term." 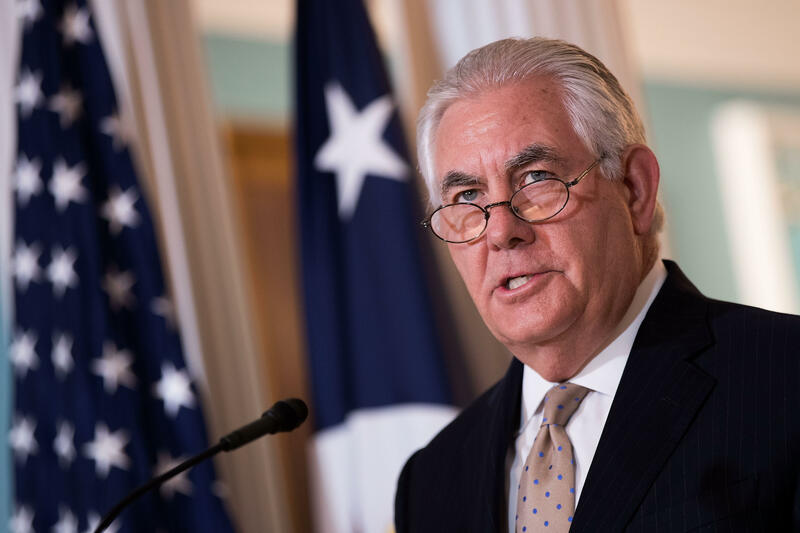 On the same day, 31 members of Congress signed a letter to Tillerson calling him to exempt the Rangel and Pickering Fellows from the State Department hiring freeze. Now, a few weeks later, it appears Tillerson has changed his mind. Last week, Tillerson's frustrations with the slow hiring process exploded during a meeting at the White House. Publicly, he has cited paperwork as the primary reason for this backlog yet it is clear that he thinks the White House could do more to expedite the paper process. One of his aides called his bunt words with White House officials a "spirited exchange" during a regular meeting. And just days following that encounter, he told reporters — for the first time — that he would like to see the hiring process sped up. In the last two weeks, there has been a uptick in the pace of nominations coming out of the White House. During this time, more than a third of the total nominations for ambassadors and senior State Department positions have come forward. The total nominated positions now snow stands at 23, out of the 188 that require congressional approval. Yet there has been no indication that the freeze has thawed beyond the exemption for the officer cases. Earlier this week, Tillerson sought to fortify the freeze: A memo was sent to all of the department heads calling for a temporary halt to all lateral movements and transfers. "These restrictions are necessary and prudent to insure we do not permit additional position and grade level growth at a time when the Department is undergoing reform and restructuring," the memo read. It also sought to clarify the fact that no actions can be taken to increase the size of the department. The memo was first reported by Bloomberg. Tillerson launched a revamp of the department earlier this year. State Department officials believe this move to stop personal movements in the building is an effort to be sure that the data being collected was not constantly changing. The review is led by an outside consulting group and was supposed to be concluded, along with results by the end of June -- but there is yet to be a presentation of that information. With the intent to make the government's lead foreign policy arm more efficient, Tillerson is considering offering a buyout to employees. The building is swirling with rumors about how this potential buyout would work. Two sources tell CBS News the State has now worked with OPM to raise the count that individuals would get in a buyout from 25,000 to 40,000. This matches what it is at other agencies like the Department of Defense. It is unclear if the buyouts will be targeted to certain classes or offices. But there could be repercussions if the buyouts are not targeted because the majority of the retirement counselors at State are eligible and willing to take a buyout themselves, one source tells CBS News. "I am just waiting to see how much the offer is," explains one State Department official who has been there for more than 30 years. "Of course it all depends what kind of money is going to be offered. I would want it to be worth my while."